I will miss all my friends, without whom I would never have gotten through the past three years. To Mary Halsey, Chrissie, Sarah, Heather, Mindy, Reyna, Philip, Alison, Amanda, Pat, Brian, Amber, Megan, and Jason... thank you. I will miss the academic environment, where every day time is spent teaching and learning. 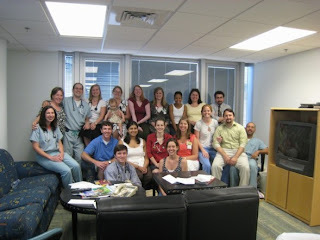 I will miss "just being a resident". Now I am the authority, I am the advice-giver and the mommy-calmer, I am the pediatrician. I just successfully completed my Last Call Ever! Ron has his time-trials, but call is my torture-fest. Luckily for me though, this one was not all that bad. I only admitted three kiddies, and they weren't the sickest bunch. I rested most of the night even! I'll have call when I get down to Auburn, but it won't be the same...I'll at least have the CHANCE to sleep in my own bed! Anyway, just wanted to celebrate that little accomplishment... that and the fact that I have just 3 weeks of residency left to go! Yahoo! RON MADE THE PARALYMPIC TEAM!!! He has been nervous for weeks, not sleeping well, not riding at his best, but training like his life depended on it! And yesterday, all his preparation paid off! 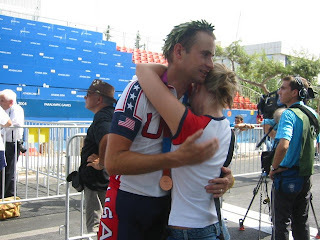 He flew out to Denver midweek (and lost his bikes along the way--- THANK YOU to the angel at the Denver airport who rescued them at the last second from making an additional flight to who-knows-where) to compete in the Paralympic trials. This was his last chance; he had to not only beat his time standard to make the team, but he had to do it by a greater margin than all the other guys. 20-ish cyclists of various "disability" categories all racing for 3 more spots. Ron had to race a 10 mile time trial... a gut-wrenching puke-inducing torture fest where it's just him and his bike. Finishing in 18 minutes and 50 seconds, he not only beat his time standard, but he beat all the rest of the competitors.... meaning, we're going to Beijing baby!! In addition, that means that Ron is the US Paralympic Cycling National Champion! I am so so so proud of him... with so few spots, we were both really worried, and I did not want him to be heartbroken. So, we will enjoy the next few days, then for Ron, it will be training training training for the big show! And for me? Planning another trip, I guess!